Today, December 1, 2016, is the 435th anniversary of the martyrdom of Blessed Edmund Campion, S.J. Yes, Father Edmund Campion was put to death after suffering extreme tortures at the hands of the "civilized" English solely because he held to the Faith that had shaped the people and the institutions of England for nearly a thousand years. Father Campion was excoriated as a "traitor" and a "papist" for holing fast to the manner in which Englishmen had worshiped for the better part of a millennium. The tortures visited upon him were approved by none other than "Good Queen Bess" herself, Elizabeth I, the daughter of the bloody tyrant Henry VIII by Anne Boleyn. Although Father Campion had his admirers and won over a few of his jailers and some lukewarm Catholics to the Faith, his execution was hailed by the mob as an act of "justice." The bloody revolt against papal supremacy by King Henry VIII began in 1534. He had "married" Anne Boleyn a year before. Over 72,000 Catholics who remained faithful to Rome were put to death between the time the Act of Supremacy was passed by the Parliament in 1534 and the time of Henry's death by means of a wretched disease in 1547. Over 72,000 people, a simply astounding figure representing 3.1% of the Englishmen then alive at the time. Henry was concerned about personal loyalty to himself as the self-proclaimed "supreme head of the Church" in England. His cause was not that of Protestantism but of his own sinful desires. Others around him, including Anne Boleyn and Thomas Cranmer and Thomas Cromwell, were influenced by Protestantism as they sought their own ambitious ends in order to wipe out "Roman" Catholicism from the land and to replace with a subtle mixture of familiar "Catholic" elements and the novelties of Protestantism, thus confusing many people who believed that the Church of England was merely a continuation of what they had experienced in the past save for a "few" changes and novelties. The irony of this is that Henry probably thought he was a Catholic to the day he died, only an English Catholic who had "stood up" for rights of the civil state in opposition to the "interference" of Pope Clement VII. There were revolutionaries around Henry, however, who were committed Protestants, intent on changing liturgy and doctrine, being able to do so with the full support of Henry's immediate heir, his son by Jane Seymour, Edward VI, who governed by means of council of regency as he was but nine year of age when he acceded to the English throne. The revolutionary process was halted from 1553-1558 during reign of Queen Mary, Henry's daughter by his true wife, Catherine of Aragon, but begun again under Mary's half-sister, Elizabeth I, who had no real religious convictions but wanted the religion of realm to be thoroughly Protestant, sharing her depraved father's penchant for the shedding of the blood of those who remained faithful to Rome, faithful to the fullness of the perennial truths of the Catholic Faith, faithful to the way in which every Englishman had worshiped prior to Henry's revolt and the subsequent--and seemingly never-ending--changes unfolded in the decades thereafter. It was under Elizabeth's most bloody reign that Edmund Campion, who once had the favor of the Queen herself, decided to turn his life over to the restoration of his beloved England to the Catholic Faith, and it was for this that he was deemed a traitor and a scoundrel by so many of his fellow countrymen. Isn't it interesting, ladies and gentlemen, that there are Americanist Catholics across the ecclesiastical divide who act self-righteously whenever it is pointed out that there is a necessity of converting the United States of America to the Catholic Faith and that the first clergymen in this country were just as intent on conforming themselves to the novelty of "religious liberty" as the Anglican "priests" in England were intent on doing the bidding of the English monarchy during the Protestant Revolt? It is also more than a little interesting to point out that the majority of Englishmen not only lost the Faith but became bitter foes of almost everything they had believed and done as Catholics within a short period of time. Blessed Edmund Campion was put to death in 1581, just forty-eight years following the "marriage" of Henry Tudor to his scheming mistress, Anne Boleyn. Most Englishmen had become rabid in their hatred of the Immemorial Mass of Tradition and all of the other ancient customs and traditions of the Catholic Church. The passage of less than half a century saw the flushing of the Catholic past of England down the Orwellian memory hole as monks and sisters were driven out of their monasteries and convents as the tenant farmers who lived off of the lands of those monasteries and convents were forced off of them to become the ancestors of the urban poor in England who were at the mercy of the grubby Calvinist capitalist industrialists a little over 170 years later. Imagine that, will you? Less than a half a century. Oh, how long has it been since Angelo Roncalli/John XXIII began his "opening up" to the world?" That's right, fifty-eight years. The parallels between the Protestant Revolution in England and the conciliar revolution in our own day are truly striking. The Protestants in England, men and women who were a strange amalgam of Catholicism and Lutheranism and Calvinism and of the "teachings" of Ulrich Zwingli (which would give rise to Methodism, the breakaway religion from the breakaway religion known as Anglicanism), changed the Mass. They changed the rite of episcopal consecration. They instituted a married clergy. Their defined beliefs were exercises in the sort of syncretism we see at work today in contemporary ecumenism. Only a handful of Catholics resisted openly. Others went along, sometimes out of fear of human respect, sometimes out of fear for their physical lives, sometimes out of fear for losing their property. Still others were confused terribly by the situation. Does it sound familiar? A fundamental loss of faith in the space of less than half-a-century effected by liturgical and doctrinal revolutionaries. Does it sound familiar? "But George," asked Father Campion, "doesn't that mean that the people, too, are confused? Are they all for the decrees of Elizabeth, by which they are not allowed to hear Mass and must reveal their knowledge of the whereabouts of priests? Or dot they rebel against those decrees? What is it like in England now? "Father," answered George, "things are in a terrible state of confusion. Catholics are bewildered. Some will go to the services that Elizabeth has commanded must be the general rule. Others think they must in conscience stay away, though they have to pay enormous fines if they do not appear at their parish church every Sunday. "Most of the older priests who were restored to their parishes under Queen Mary--bless her--have not taken a firm stand against the new laws, and so, the body of the Catholics do not know where to turn. Thanks be to God, we hope that men like you and Father Persons will draw up some plans of definite action for us. We are ready, all the Catholics I know, to do what we must for the cause of Christ and His Church, but we must have leadership." "That, George, with God's help, is what we are here for. We are to help turn the tide. It may seem a hopeless task, but we are sure, absolutely sure, of victory. It may not come today or tomorrow, but come it must and will. And so, we are gay, no? This is not time for heavy hearts, for we are on the winning side because it is God's side; and the heretics are on the losing side, because it is opposed to God. "Well, more of this later when Father Persons returns and we get down to the plan of action. Now, do you have a bite to eat for Mr. Edmunds and his man? Come, Brother Ralph, let's break bread for the first time in England in many a year. We'll sup often from now own, I fancy, just leaning down in the saddle or catching a bite while the relay of horses is being brought up. Now let's sit and sup at our leisure, just as though all of England were welcoming us home." Now Edmund had not been raised a Catholic. His parents apparently had yielded years before and were living in the rather slipshod way of many other Catholics. What is the use of getting excited? they asked themselves. This is all a temporary state of affairs, and one day the Queen will change her mind, or perhaps marry a Catholic prince, and then all will be as it used to be. Let's just wait out the present unpleasant state of affairs. This was how many Catholics felt and thought, but Edmund was not made of such lazy thinking and weak will. And Sir William Cecil, one of the Queen's advisers, who was in favor of being more severe on the Catholics, saw his opportunity. He sent orders to Ireland that the laws against the Catholics were to be more strictly enforced, and that those suspected of leanings toward Rome should be hunted and questioned. Edmund Campion had never been a man to hide his thoughts, and many of the English officials in Dublin had heard him express his doubts about the spiritual supremacy of Queen Elizabeth. That very month Edmund started living the life of a fugitive. Little did he know that not many years later he would be one of the most sought-after fugitives in the long history of the persecution of Catholics in his beloved England. From March until May he slipped from the house of one friend to another, always being careful to leave no trace and to bring no suspicion on his protectors. In May  he sailed back to England [from Ireland], where he remained concealed, waiting to get across the Channel to the Low Countries. He appeared in public once, in disguise and under the name of Mr. Patrick. He was in the crowd at Westminster Hall to witness the trial of a Dr. Storey. This old gentleman had been picked up by the English secret police in Antwerp, where he had sought refuge in his declining years, and been brought back in chains to be tried for treason. Actually, his crime had been that he was a staunch Catholic under Queen Mary. He was executed most brutally on June 1, but this time Edmund Campion was on board a little vessel on his way to Douai. Edmund must have brooded, as he looked out at the choppy waves of the Channel, on the horrible fate of Dr. Storey. He had not waited to see it, but he could well imagine it, for he had heard accounts of other hangings, drawings and quarterings. Above all, his thoughts ran on the charge of treason he had heard trumped up against the aged martyr. "Treason!" he thought. "How can it possibly be treason to remain faithful to Christ and His Church--as all of Christendom has done these many centuries until the England I love rebelled against the Pope? If the Catholic faith makes a man a traitor, then I shall soon be a traitor, for if God help me, I shall soon be reconciled to Rome, and repudiate the false ordination I so wrongfully allowed myself to receive, I shall make up to my Lord Christ for my weakness. So be it." Father Campion worked through Berkshire, Oxfordshire and Northamptonshire, always stopping at the house of some prominent Catholic, where he was welcomed in the following fashion. This account is taken from a letter written to Rome and telling how the Jesuits made their way through the countryside. "When a priest comes to the houses of the Catholic gentry, they first salute him as a stranger unknown to them, and then they take him into an inner chamber where an oratory is set up, where all fall on their knees and ask his blessing. Then they ask how long he will remain with them, and pray him to stop as long as he may. If he says he must go on the morrow, as he usually does--for it is dangerous to remain longer--they all prepare for confession that evening; the next morning they hear Mass and receive Holy Communion; then after preaching and giving his blessing a second time, the priest departs and is conducted on his journey by one of the young gentlemen. "No one in these parts is to be found who complains of the length of the services; if a Mass does not last nearly an hour, many are discontented. If six, eight or more Masses are said in the same place, and on the same day (as often happens when there is a meeting of priests), the same congregation will assist. When they can get priests, they confess every week . . . A lady was lately told that she should be let out of prison if she would just once allow herself to be seen walking through an Anglican church. She refused. She had come into prison with a sound conscience and would depart with it, or die. In Henry's day [King Henry VIII], the whole kingdom, with all its bishops and learned men, abjured its faith at one word of the tyrant. Be now, in his daughter's days [the daughter was Queen Elizabeth], boys and women boldly profess their faith before the judges and refuse to make the slightest concession even at the threat of death. "The adversaries are very mad that by no cruelty can they move a single Catholic from his resolution, no, not even a little girl. A young lady of sixteen was questioned by the sham bishop of London about the Pope, and answered him with courage, and even made fun of him in public, and so was ordered to be carried to the public prison . . . One the way she cried out that she was being carried to that place for her religion." iii. My charge is, of free cost to preach the Gospel, to minister the Sacraments, to instruct the simple, to reform sinners, to confute errors-in brief, to cry alarm spiritual against foul vice and proud ignorance, wherewith many of my dear countrymen are abused. v. I do ask, to the glory of God, with all humility, and under your correction, three sorts of indifferent and quiet audiences: the first, before your Honours, wherein I will discourse of religion, so far as it toucheth the common weal and your nobilities: the second, whereof I make more account, before the Doctors and Masters and chosen men of both universities, wherein I undertake to avow the faith of our Catholic Church by proofs innumerable-Scriptures, councils, Fathers, history, natural and moral reasons: the third, before the lawyers, spiritual and temporal, wherein I will justify the said faith by the common wisdom of the laws standing yet in force and practice. viii. Moreover I doubt not but you, her Highness' Council, being of such wisdom and discreet in cases most important, when you shall have heard these questions of religion opened faithfully, which many times by our adversaries are huddled up and confounded, will see upon what substantial grounds our Catholic Faith is builded, how feeble that side is which by sway of the time prevaileth against us, and so at last for your own souls, and for many thousand souls that depend upon your government, will discountenance error when it is bewrayed [revealed], and hearken to those who would spend the best blood in their bodies for your salvation. Many innocent hands are lifted up to heaven for you daily by those English students, whose posterity shall never die, which beyond seas, gathering virtue and sufficient knowledge for the purpose, are determined never to give you over, but either to win you heaven, or to die upon your pikes. And touching our Society, be it known to you that we have made a league-all the Jesuits in the world, whose succession and multitude must overreach all the practice of England-cheerfully to carry the cross you shall lay upon us, and never to despair your recovery, while we have a man left to enjoy your Tyburn, or to be racked with your torments, or consumed with your prisons. The expense is reckoned, the enterprise is begun; it is of God; it cannot be withstood. So the faith was planted: So it must be restored. The sufferings and humiliations that Father Edmund Campion endured following his capture were intense. "Civilized" England believed in the use of torture. So does some other supposedly "civilized" country in our own day today. Rumors were spread rapidly by the Queen's agents that he had denied the Catholic Faith, that he had broken under the pressure, that he was begging for mercy. Father Campion knew that, yes, indeed, the Searcher of Hearts, would reveal all on the Last Day. It matters not what anyone below thinks of us. It matters only how we stand in the sight of God Himself. Father Edmund Campion, S.J., knew that the Faith in his day had to be restored to his native England. The Faith in our day has to be restored to the life of ordinary Catholics, most of whom are laboring under the belief that the counterfeit church of conciliarism is the Catholic Church for which Edmund Campion gave us his life. When they started their journey through the city--they were paraded from end to end of it--the crowds laughed, and many hissed and booed the prisoners. They rode with their elbows tied behind them, their hands lashed together in front, and their feet secured underneath their horses' bellies. Father Campion was singled out for further ridicule by having a paper pinned to his hat, which read: "Campion the Seditious Jesuit." As the parade passed a section of London called Cheapside, they trooped before a cross standing in the market place. It had been battered and defaced in the religious troubles, but it was still a cross. Father Campion raised his eyes to it, bowed his head as far as he could and tried to make the sign of the cross on himself with his fettered hands. Some of the crowd pressing close to see the famous captive booed and jeered. "The Papist sign won't save you from the cross that waits you on Tyburn, you traitor." "He'll bow to the stone of the cross, but he won't bend his stiff neck to the Queen." "Haw, haw, but soon he won't have a head on top of his neck to bow with at all." Such were some of the hoots and catcalls, but some of the people looked with respect and sympathy, not to mention shame. Was this England, that an accused man could be treated as though he had already been tried and found guilty? Did he have the ghost of a chance to get a fair trial? What would happen to the country if things like this went on? Could England ever again be thought of as part of Christendom if priests and good Catholics were persecuted and put to death just because they were priests and good Catholics? These thoughts were in many minds, but they remained locked up there because it would have been dangerous to express them. But Father Campion would express them very soon and in a way that gave, even when he was in his last hours, new heart and courage to those he had come to serve. Father Gardiner could not have known in 1957 that it would be a mere ten years later that the ostensibly reigning "pontiff" at that time, Giovanni Battista Enrico Antonio Maria Montini/Paul VI, would exchange his own papal ring for that of the layman recognized as the "Archbishop" of Canterbury of a false religion, the Church of England. Ten years. Gone in almost as much of a flash as that of Catholicism in England in the Sixteenth Century was the Faith of our fathers in the life of most Catholics worldwide. Karol Wojtyla/John Paul II gave "blessings" with the "Archbishop" of Canterbury in Rome and in England itself, signifying in a de facto manner the belief that Anglican orders are valid, which they are not. Just as the Anglicans of the Elizabethan era dismissed everything prior to 1533, so is it the case today that the conciliarists dismiss those things of the Catholic Faith they find no longer relevant to "modern man," especially the "modern man" of the ecumenist bent. Obviously, Jorge Mario Bergoglio treats all Protestant "ministers," whether male or female as having a mission from Our Blesse Lord and Saviour Jesus Christ to sanctify and thus to save souls. The examples of this wretched man having done so are too numerous to list. However, it should be noted that he has treated the current archlayman of Canterbury, Justin Welby, as a legitimately consecrated "bishop." 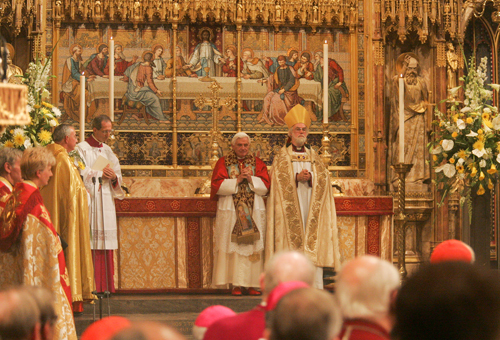 The Catholic Church needs Anglicans to remain as Anglicans? Edmund Campion and the other English and Irish Martyrs Died for This? This is nothing other than an insidious attempt to put a "papal" imprimatur on continued acts of apostasy while giving any stuffy "minders" of his in the Vatican who are concerned about what passes for orthodox conciliarism an out to say to "conservatives" in the conciliar structures that none of this matters, that it's all "unofficial." Not in the eyes of the true God of Divine Revelation, and it should not be in the eyes of any Cathlolic as Jorge Mario Bergoglio defames the martyrs who died at the hands of the Protestants, including the English and Irish Martyrs, Saint Fidelis Sigmaringen and the Martyrs of Gorkum, and the work of efforts of Saint Francis de Sales and countless of others to convert Calvinists back to the true Church. Morever, Jorge's comcept of universal salvation is such that the entire missionary work of Holy Mother Church from the time of Pentecost Sunday is rendered as a complete waste of time and effort and of the martyrs' blood. Thus, Pope Leo XIII's Apostolicae Curae, September 18, 1896, which reaffirmed the absolutely null and void character of Anglican "orders" has been treated in a de facto manner as though it no longer binds the consciences of the conciliar "popes" and "cardinals" and "bishops." Wherefore, strictly adhering, in this matter, to the decrees of the pontiffs, our predecessors, and confirming them most fully, and, as it were, renewing them by our authority, of our own initiative and certain knowledge, we pronounce and declare that ordinations carried out according to the Anglican rite have been, and are, absolutely null and utterly void. It remains for Us to say that, even as we have entered upon the elucidation of this grave question in the name and in the love of the Great Shepherd, in the same we appeal to those who desire and seek with a sincere heart the possession of a hierarchy and of Holy Orders. Perhaps until now aiming at the greater perfection of Christian virtue, and searching more devoutly the divine Scriptures, and redoubling the fervor of their prayers, they have, nevertheless, hesitated in doubt and anxiety to follow the voice of Christ, which so long has interiorly admonished them. Now they see clearly whither He in His goodness invites them and wills them to come. In returning to His one only fold, they will obtain the blessings which they seek, and the consequent helps to salvation, of which He has made the Church the dispenser, and, as it were, the constant guardian and promoter of His redemption amongst the nations. Then, indeed, "They shall draw waters in joy from the fountains of the Savior", His wondrous Sacraments, whereby His faithful souls have their sins truly remitted, and are restored to the friendship of God, are nourished and strengthened by the heavenly Bread, and abound with the most powerful aids for their eternal salvation. May the God of peace, the God of all consolation, in His infinite tenderness, enrich and fill with all these blessings those who truly yearn for them. We wish to direct our exhortation and our desires in a special way to those who are ministers of religion in their respective communities. They are men who from their very office take precedence in learning and authority, and who have at heart the glory of God and the salvation of souls. Let them be the first in joyfully submitting to the divine call and obey it, and furnish a glorious example to others. Assuredly, with an exceeding great joy, their Mother, the Church, will welcome them, and will cherish with all her love and care those whom the strength of their generous souls has, amidst many trials and difficulties, led back to her bosom. Nor could words express the recognition which this devoted courage will win for them from the assemblies of the brethren throughout the Catholic world, or what hope or confidence it will merit for them before Christ as their Judge, or what reward it will obtain from Him in the heavenly kingdom! And we, ourselves, in every lawful way, shall continue to promote their reconciliation with the Church in which individuals and masses, as we ardently desire, may find so much for their imitation. In the meantime, by the tender mercy of the Lord our God, we ask and beseech all to strive faithfully to follow in the path of divine grace and truth. Is this why Father Edmund Campion, S.J., was willing to lay down his life? For this exercise in religious indifferentism? Where were the howls of protest from Raymond Leo Burke, Walter Brandmuller, Carlo Caffarra, and Joachim Meisner when the outrage pictured above occurred? There were none. They never said a word in protest of any ecumenical event, nor have they ever said anything in defense of the proper ends of the Sacrament of Holy Matrimony despite all of their understanding that Bergoglio is attacking the indissolubility of marriage. These four have been part of the problem, and there is truly nothing of the courage of Blessed Edmund Campion in them. On the one hand, therefore, it is necessary that the mission of teaching whatever Christ had taught should remain perpetual and immutable, and on the other that the duty of accepting and professing all their doctrine should likewise be perpetual and immutable. "Our Lord Jesus Christ, when in His Gospel He testifies that those who not are with Him are His enemies, does not designate any special form of heresy, but declares that all heretics who are not with Him and do not gather with Him, scatter His flock and are His adversaries: He that is not with Me is against Me, and he that gathereth not with Me scattereth" (S. Cyprianus, Ep. lxix., ad Magnum, n. I). Acknowledging the "legitimacy" of Anglican orders is receding from the "doctrine proposed by the" Church's "authoritative Magisterium" by more than a little bit. It is an effort to undermine the infallibly binding nature of Apostolicae Curae and to spit on the English Martyrs. What must the prisoners of the sixteenth century have thought when the doors of the Tower closed upon them? Few men--or women--ever came out of the Tower in those days to tell what it was like inside. Most who emerged came out to go to their death at Tyburn. When Father Campion knelt in his cell, praying for strength to be brave and loyal to Christ to the end, he knew enough about the treatment that was most likely in store for him to have every reason in the world to be filled with fear. He had heart of the The Pit, in which a prisoner might be confined for weeks and months. It was a cave running down for twenty feet and in absolute darkness. He knew of Little Ease, a cell so constructed that a prisoner could not stand upright nor lie down at full length. Another form of torture was The Scavenger's Daughter. This was a broad hoop of iron which ran between the legs and over the head and forced the prisoner to remain in a crouched-over, cramped position. When this was maintained for days or more, it frequently was impossible for the poor prisoner ever to stand upright again. Before Father Campion's vision rose, too, images of the iron gauntlets that fitted over the wrists and could be tightened with screws, and of the awful rack. This last instrument of torture was a wooden frame with rollers at each end Ropes ran around the rollers and the ends of the ropes were fastened to the prisoner's wrists and ankles. Then, when the rollers were revolved, arms and legs were stretched, often so far that all the limbs become disjointed. One of the cruelest of the rack-masters, as they were called, was a man named Topcliffe. He performed his horrible work some years after Father Campion had met his Lord at Tyburn. He once boasted, referring to another Jesuit he was going to torture on the rack, that he would "make him a foot taller than he was before." Is it any wonder, then, that for Father Campion, and for hundreds of others like him in those terrible days, the Tower of London was not a pleasant or quaint place, but an abode of horrors? Is there any wonder that he, known for his bravery and his gallantry, now knelt in his dismal cell and repeated the prayer that our Lord had uttered to His Father during His agony in the garden" Not My will but Thine be done"? Christ's hero did not have long to wait before his worst anticipation began to come true. The warden of the Tower was Sir Owen Hopton, who was seeking advancement in the Queen's service. As soon as he heard that the famous Campion, the biggest prize yet to be caught, would be committed to his charge in the Tower, he thought, "I'll show the Queen and Lord Leicester how zealous I can be in the performance of my duty. From the very start I'll be as severe as I can with the traitor, and when Her Majesty hears of it, she will certainly give me a promotion. At the very moment when Father Campion was praying in his cell, Sir Owen was giving orders to have Little Ease mad ready for him. On the afternoon of July 22, the door of Father Campion's cell groaned open, and a jailer's voice growled. "Come along, seditious Jesuit, we have a little surprise for you." Father Campion blessed himself, rose and followed down the gloomy corridors. Another door swung open and he saw before him the small room, absolutely bare and almost pitch-dark, even with the door open, which he knew to be Little Ease. Sir Owen stood to one side, elegant and disdainful, watching the weary, disheveled man gaze in fascinated horror at the dreadful room. "Well, then, Mr. Campion," he said mockingly, "where is all the bravery you protest in your lying Brag? If the sight of our Little Ease affrights you so much, how pale do you think your face will become when you see some of the other means we have here to break the spirit of rebellious citizens like you and your fellow-priests?" "Fear is not the same as cowardice, Sir Owen," responded Father Campion with a calm dignity, and a trace of his famous smile began to show on his haggard face. "I never said, nor could I, for I am a man, and not an angel, that I would not feel fear at what lies in store for me. But I did say, and with the grace of Our Lord, I will prove it, that I would not be broken in spirit and betray either my Lord Christ or those Catholic friends who have sheltered me and to whom I have brought the Holy Mass and the word of God." "Humph! Well, we shall soon see. In with the man, and let him think over his deeds and his boasts for a while." "By what right am I subjected to this torture? cried Father Campion in a commanding voice. "I am an Englishman, I have not been tried, I have not yet been found guilty of any crime. Torture is for criminals--if indeed it is for anyone who is a human being. I demand to see the writ of the Privy Council which gives you the authority so to treat me." "You can demand until you are blue in the face, my good Papist," snarled Sir Owen. "I am the master of this Tower, and who's to know that I have given you a little taste of discipline? He nodded his head to one of the jailers. The man stepped behind Father Campion, grabbed him by the shoulders and pushed him, not too gently, into Little Ease. The door was slammed shut; the darkness closed in on the figure of Edmund Campion huddled in a cramped, bent-over, standing position. Who in in the counterfeit church of conciliarism is talking about the conversion of England--or any other nation, say, Russia, for example? Not Giovanni Montini/Paul VI, who "canonized" Blessed Edmund Campion as one of the Forty Martyrs of England in 1970. Not Karol Wojtyla/John Paul II, who did not believe that anyone or any nation had to be converted to the Catholic Faith. Not Joseph Ratzinger/Benedict XVI, who reaffirmed the heresy of religious liberty throughout his false "pontificate" and who received a relatively small number of disgruntled "Anglo-Catholics" into his own structures without demanding that they make an abjuration of error while he permitted them to use liturgical books that were deemed heretical by Pope Saint Pius V in Regnans in Excelsis, March 5, 1570 (see Ever Faithful To His Infidelity). And certainly not Jorge Mario Bergoglio! Blessed Edmund Campion was willing to shed his blood for the conversion of England. Conversion. Men who are outside of the Catholic Church must convert to her maternal bosom. So must nations. This is a mission that the Catholic Church has received from Our Blessed Lord and Saviour Jesus Christ Himself. The counterfeit church of conciliarism is not only refusing to fulfill this mission it is denying that it has such a conversion to convert all men and nations explicitly to the Catholic Faith. "We are prepared, Mr. Campion," she said, as though offering a great favor, "we are prepared to advance you in the service of the Church of England if you will make a public declaration that you have abandoned the Church of Rome. There may be no limit to the honors that may come to you if you will renounce the Pope and all he stands for. Give it careful thought, Mr. Campion, for the choice before you is either honors or death." There was a deadly silence in the room--for the space of a few seconds only. Then the Queen and her advisers heard the most unlikely sound--the sound of laughter. It was not loud, but a sort of deep chuckle that welled up from the heart and soul of Father Campion. It was the laughter of a Christian man who knew that he had won. At last he had it from their own lips--he was to be put to death solely because he was a Catholic and a priest. Politics had nothing to do with what they thought of him. The people of England at the time might think that he was going to his death because he was a traitor, but those who were to send him to Tyburn had declared that he was to die for his faith. One day the whole world would know the truth. He had won! "I remain true to Christ and His Church," he ended in a loud and triumphant voice. There was another dead silence--this time for more than a few seconds. The Queen and her councilors stared--it seemed even with admiration--at this handsome, talented, brave young man, who had the world at his feet and preferred the horrors of the Tower and Tyburn. The Queen sighed, waved her hand. The doors opened; the prison guard waited to surround Father Campion and lead him back to the Tower. The martyrdom of Father Edmund Campion on this date four hundred thirty-five years ago today will go largely unrecognized in the counterfeit church of conciliarism even though this is an "optional memorial" in the Protestant and Judeo-Masonic Novus Ordo liturgical calendar. Also unrecognized will be the fact that a man who witnessed Father Campion's martyrdom on December 1, 1581, one Henry Walpole, went on to become a Jesuit priest and to be martyred on April 7, 1595, and that one of Blessed Edmund's young associates, William Harrington, was also ordained a priest and martyred at Tyburn on February 18, 1594. None of this can be mentioned repeatedly today, admitting that Ratzinger/Benedict did make reference to the sufferings of the English Martyrs during one of the "homilies" that he gave in England in September of 2010. In like manner, you see, those who have brought the Faith to Catholics in the underground and who make no concessions to conciliarism at all will be hounded and harassed by even believing Catholics as they stand fast to the fullness of the perennial truths of the Catholic Faith as did Edmund Campion. These brave bishops and priests know that their reward is not here. They are willing to suffer all manner of humiliations as the consecrated slaves of Our Blessed Lord and Saviour Jesus Christ through Our Lady's Sorrowful and Immaculate Heart in order to try to help restore in a flash what was lost as quickly in our own day as was lost in England in the days of Edmund Campion: the Catholic Faith. It was about a century after the martyrdom of Blessed Edmund Campion that Blessed Claude de la Colombiere was sent by the Society of Jesus to England to minister to the spiritual needs of the future King James II, then the Duke of York. Blessed Claude knew that the path to the conversion of England ran through the Most Sacred Heart of Jesus, having come to believe that Our Lord had made known to Sister Margaret Mary Alacoque what he had made known earlier to Saint Gertrude the Great. Blessed Claude, who had the gift of discernment, was not a man to believe anything lightly; but he had too striking proofs of the high and solid virtue of this person (St. Margaret Mary) who spoke to him to dread any illusion. Therefore he applied himself immediately to the ministry that God had confided to him. But to acquit himself of it solidly and perfectly, he wished to begin by himself; he consecrated himself entirely to the Sacred Heart of Jesus; he offered to It all that he thought capable of honoring and pleasing It. The extraordinary graces which he received from this practice soon confirmed him in the idea that he already had of the importance of solidity of this devotion. He had no sooner considered the sentiments full of tenderness that Jesus Christ has for us in the Blessed Sacrament in which His Sacred heart is always burning with love for men, always open to pour out on them all kinds of graces and blessings, that he could no longer think without grieving of the horrible outrages which Jesus Christ suffers at the hands of heretics and of the strange contempt with which even the generality of Catholics treat Jesus Christ in this august Sacrament. This neglect and contempt, and these outrages touched him sensibly and obliged him to consecrated himself anew by this beautiful prayer which he calls the offering to the Sacred Heart of Jesus. . . . Blessed Edmund Campion, S.J., pray for us. I welcome you, distinguished representatives of the Hussite Czechoslovak Church and of the Evangelical Church of Czech Brethren, who are in Rome to celebrate, at the tombs of the Apostles Peter and Paul, a Liturgy of Reconciliation on the occasion of the 600th anniversary of the Reformer Jan Hus. I give a cordial greeting to Cardinal Miloslav Vlk. This meeting gives us the opportunity to renew and deepen the relations between our communities. In obedience to the will of the Lord Jesus, who on the eve of his Passion and Death prayed to the Father for the unity of his disciples (cf. John 17:21), we have the duty to promote increasing mutual knowledge and active collaboration. Many disputes of the past call to be revisited in the light of the new context in which we live, and agreements and convergences will be reached if we address the traditional conflictive questions with a new look. Above all, we cannot forget that our shared profession of faith in God the Father, in the Son and in the Holy Spirit, in which we were baptized, already unites us in bonds of genuine fraternity. Six centuries have passed since the day that the renowned preacher and Rector of the University of Prague, Jan Hus, died tragically. Already in 1999, Saint John Paul II, intervening in an International Symposium dedicated to this memorable figure, expressed his “profound regret for the cruel death inflicted [on him],” and he numbered him among the Reformers of the Church. In the light of this approach, the study must continue on the person and activity of Jan Hus, who for a long time was the subject of contention among Christians, while today he has become a reason for dialogue. This research, carried out without conditioning of an ideological type, will be an important service to the historical truth, to all Christians and to the whole society, also beyond the boundaries of your Nation. Vatican Council II stated: “the renewal of the Church,” which “consists essentially in enhanced fidelity to her vocation … Hence, this renewal has a singular ecumenical importance” (Unitatis redintegratio, 6). Today, in particular, the need for a New Evangelization of so many men and women that seem indifferent to the joyful news of the Gospel, renders urgent the duty of renewal of every ecclesial structure, in order to foster the positive answer of all those to whom Jesus offers his friendship (cf. Apostolic Exhortation Evangelii gaudium,27). And the visible communion among Christians will surely render the proclamation more credible. Responding to Christ’s call to continuous conversion, of which we are all in need, we can progress together on the path of reconciliation and peace. Along this path we learn, by the grace of God, to recognize one another as friends and to consider others’ motivations in the best possible light. In this connection, I hope the bond of friendship will be developed also at the level of the local and parish communities.